I never bought anything, other than our indoor/outdoor rug, for the porch because, let’s be honest, the porch was in some state of construction the past few months, and they still have some things they need to fix. So I figured we’d just buy furniture and planters this spring when everything is, hopefully, said and done. Because of the lack of furniture and planters, I was starting to feel stressed about decorating for the porch for Christmas because it’s something I love to do, but I clearly wasn’t working with much. Then, I spotted some pre-made holiday planters while walking out of Costco almost two weeks ago I thought, “Oh, these are really nice. But do I want to spend $29.99 each?” I snapped a photo of them, got in my car, drove home, and couldn’t stop thinking about them. So I did the logical thing and texted Brad to tell him we were going on a family outing to Costco when he got home from work. When we got to the store, it took me approximately 10-15 minutes to choose exactly which planters I wanted. I’m sure I looked like a lunatic, but this was an important decision. While I was deciding on planters, Owen was test-sitting the Power Wheels Jeep he wants Santa to bring him for Christmas. It took Brad and me approximately 15 minutes to coax him out of said Jeep. Never take your kids to Costco during the holiday season. 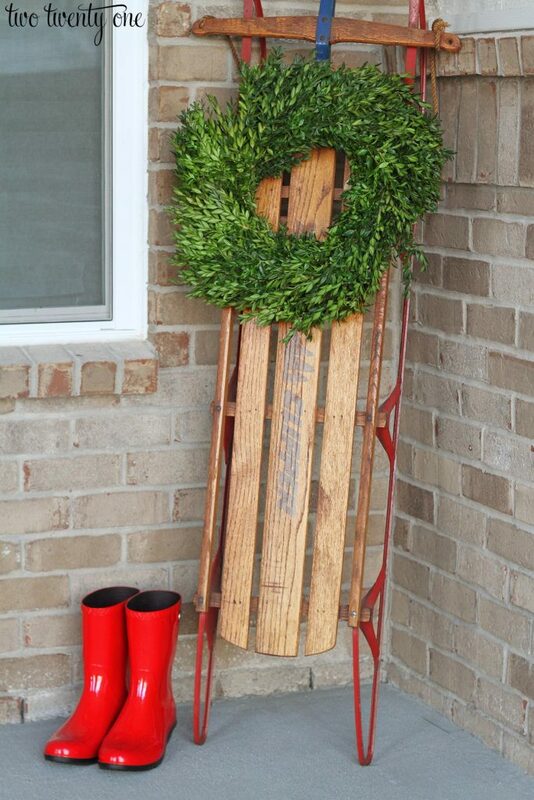 In the corner of the porch, I set out the vintage sled my brother and I used as kids. 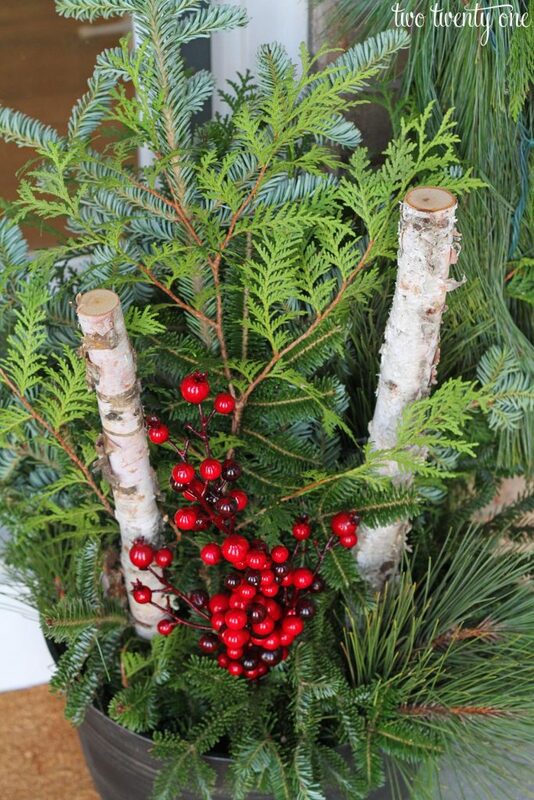 I wired a Trader Joe’s fresh boxwood wreath to up the holiday factor. And because I feel like every blogger has to include some sort of boots in their Christmas photos, I threw in my favorite red (not Hunter) boots for good measure. Ok, back to the entryway portion of the porch. I flanked the door with two of the Costco planters. The planters are a plastic material, but they look like sturdier oil rubbed bronze planters. And I’m not going to lie, I love the look of the plaid indoor/outdoor rug with the oversized ‘Merry’ rug. 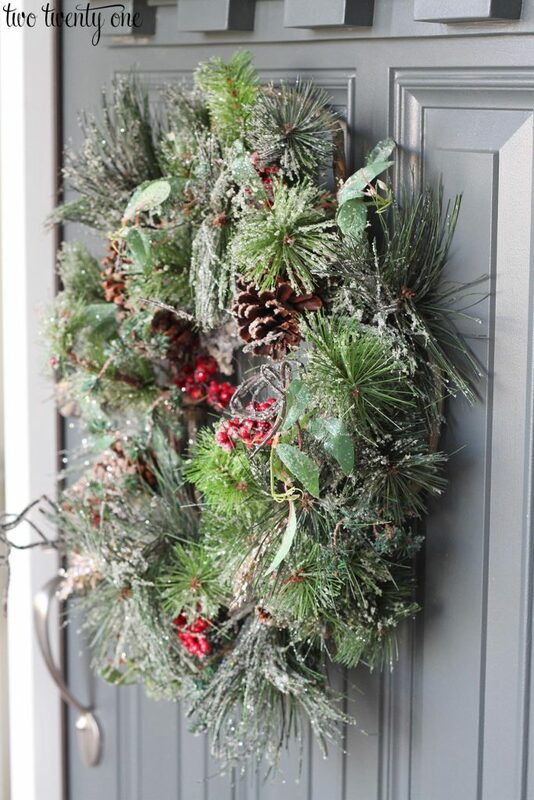 Using a Command Brand outdoor hook, I hung this wreath, which was made by Brad’s grandparents, on the front door. While I was at Costco, debating over which planters to get, I picked up this 25-foot fresh cedar and pine garland for $18. I wired a strand of 100 white Christmas lights to the garland and hung it above the transom with two nails. 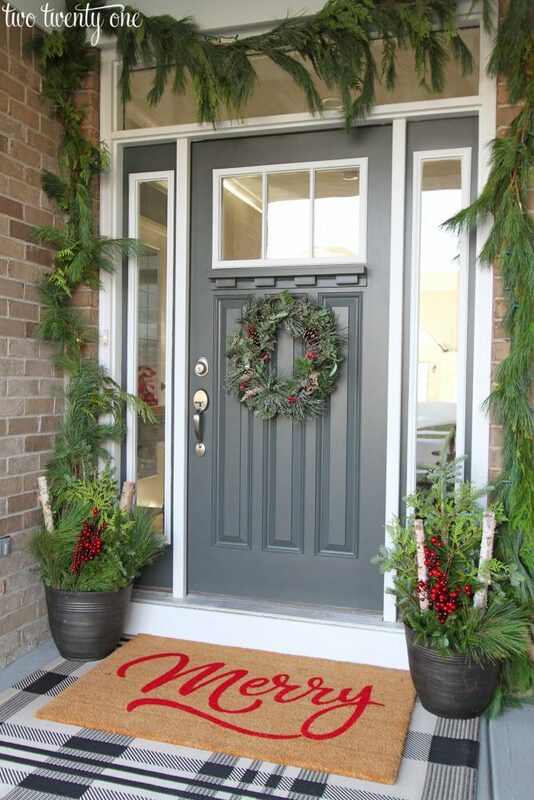 I get a lot of questions about our front door, which is manufactured by Plastpro. While this door isn’t the exact same, it’s very similar. The birch branches will last a couple years, yes? Because I definitely don’t plan on throwing them away after Christmas. 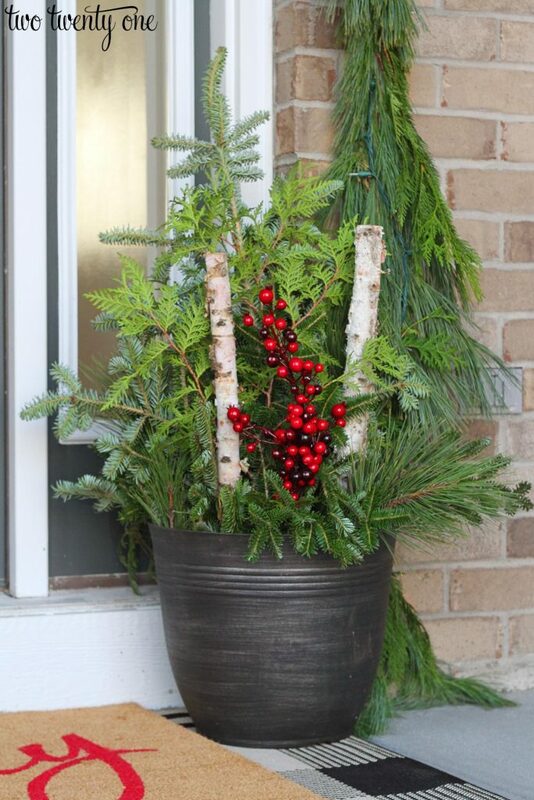 I may even swap out the faux red berries for something less Christmasy and keep the planters on the porch into January, assuming they live that long with frequent watering. 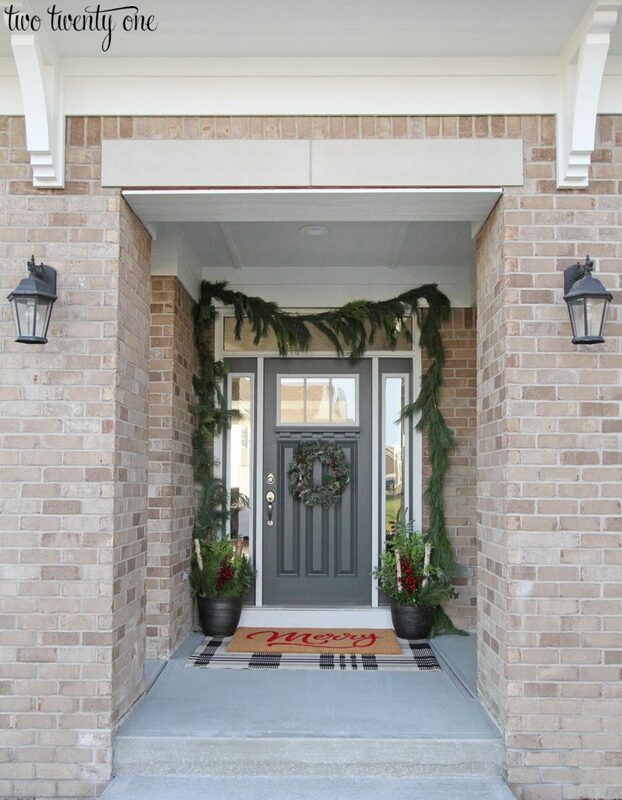 Here’s how the porch looks as you walk up to the front door. In case you’re looking for more front porch inspiration, I’ve teamed up with 9 other bloggers who are also sharing their front porches today. 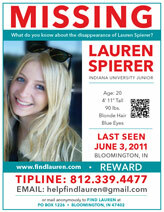 Be sure to check them out! Lovely. That plaid rug is amazing. It looks great! 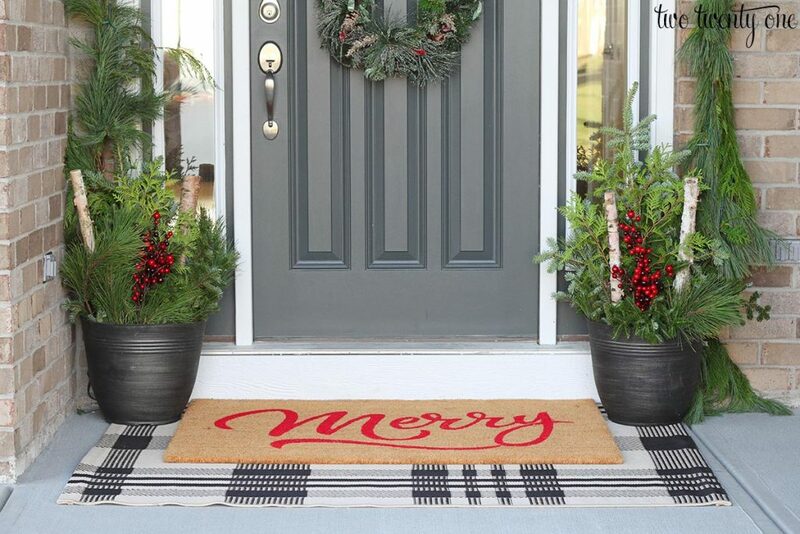 I love the combo of the plaid rug with the merry doormat. 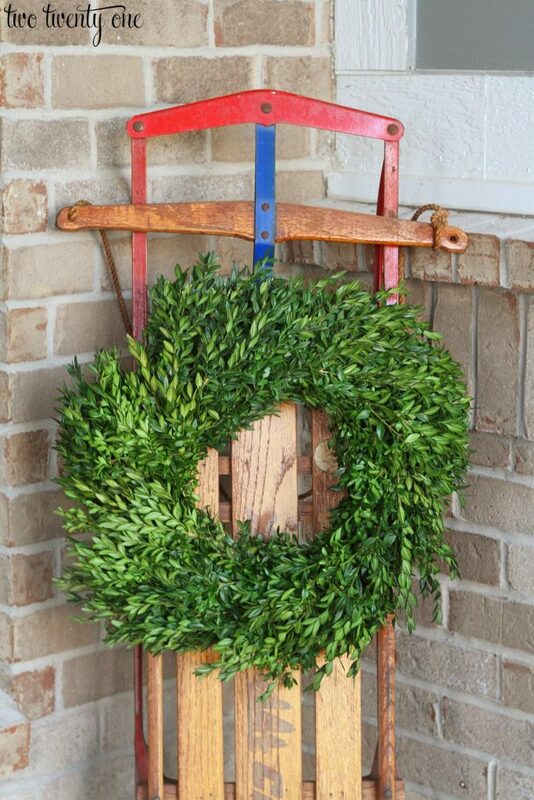 I’m going to try to recreate something similar on our porch. I adore your porch! That merry rug is the cutest! Costco. And I have no clue. Try Googling “craftsman entry door”. I would also love to know who the manufacture of your front door is. 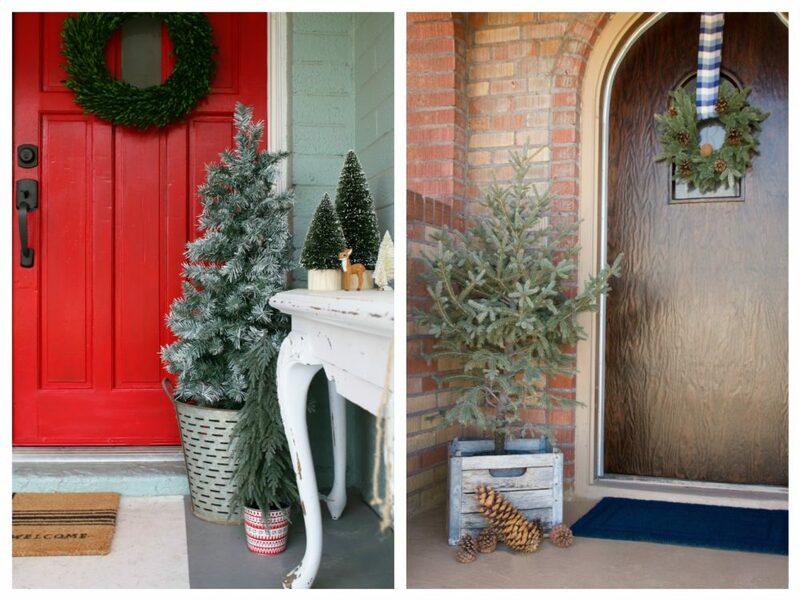 Your front porch is festive and very welcoming. I seriously LOVE your rug situation, so much so that I’ve been stalking that plaid rug on Wayfair for months. No lie. So today the search got serious and I found it on Amazon!!! It’s literally sold out everywhere else. But by gosh, by the end of this month I will have one of them in my hands. Can’t wait! My front stoop needs some serious love. 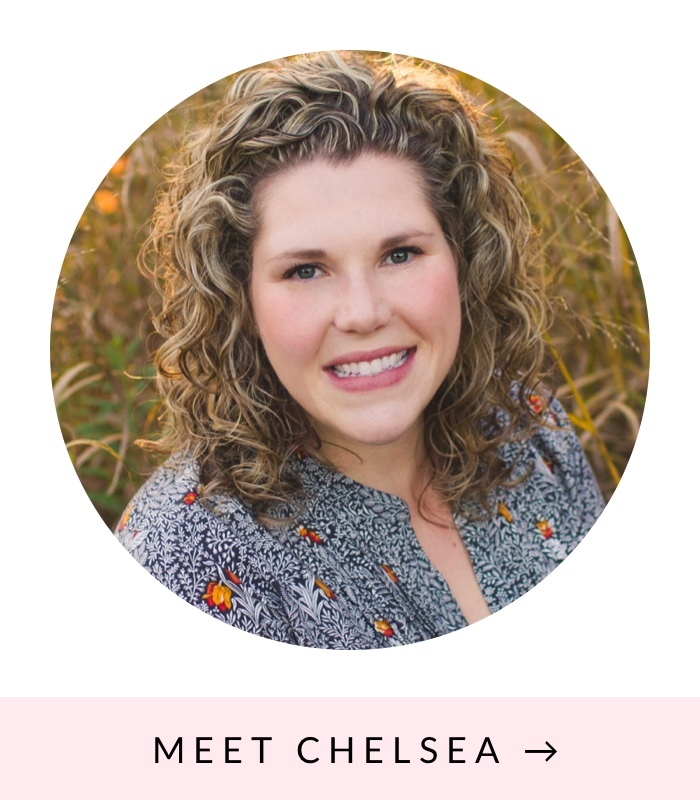 totally love the sled Chelsea! And that doormat combo is perfection! Happy Holidays to you and yours. Hi Chelsea What size is the plaid rug used. Love the porch. Thank you.